This morning I started hanging my hummingbird feeders outside. For some reason, I didn't think they would even come around until this month, May. I thought that I would hang the feeders and it would take several weeks for them to fly by and find them. How wrong I was! I had barely finished hanging the next to the last feeder when suddenly, this hummingbird came flying close to me ready to feed! He didn't even wait until I had finished and had gone into the house. I absolutely love watching the hummingbirds in the summer (it doesn't take much to make me happy). And I'm excited that they are already here and were waiting for my feeders. This picture is from last summer. I look forward to getting more photos this year. 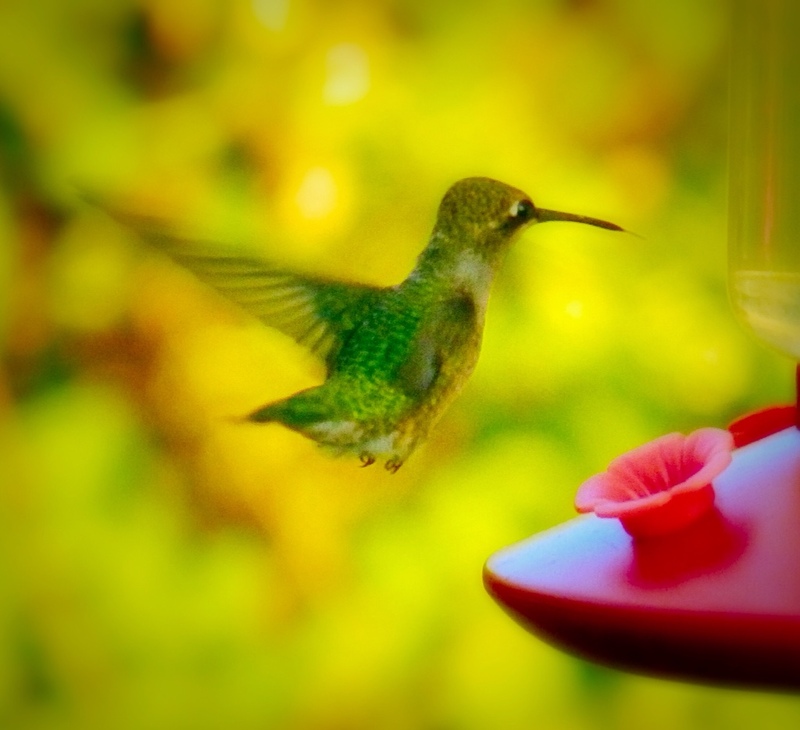 Do you enjoy watching hummingbirds and/or other birds/wildlife in your yard? This is a hummingbird. They eat flower nectar. I make nectar with 4 parts water and 1 part sugar. I boil it so the sugar will melt then let it cool down. To get this picture, I stood outside with my camera to my face without moving or taking a picture until they were comfortable with me being there, then I snapped the photo. It sounds wonderful! You must live in the woods and close to a river or stream. Sounds beautiful! Wow! You just reminded me I need to get mine out! YIPPEE!! Yes! I now know to get them out sooner next year! I’m green with envy.. but at least we have robins and other little sweet birds. That’s nice you have a wildlife refuse! That must be wonderful. Thank you Ruchi! I hope they do too. I want to try and get some good photographs of them (if I can). Last year I had to stand out by the feeders very quiet with my camera to my eyes without snapping, until they got comfortable with me being there. Then I started snapping. What a stunning, beautiful capture! I haven’t seen hummingbirds around here. Thank you so much! Have you tried hanging hummingbird feeders to see if they come to feed? I looked on the internet and yes, there are hummingbirds in Texas, in fact, more variety than where I live. I think if you put out feeders for them you might draw some to your yard. I didn’t know the hummingbirds were even here yet until I put out my feeders this morning. Unless you have a lot of flowery bushes and flowers you probably won’t see them unless you do put up a feeder. Oh, and I know many species of hummingbirds migrate to Mexico for the winter so Texas isn’t too hot for them. My feeders are out but no birds yet…my feeders hang on my windows with a suction cup and it’s pretty cool to watch them come right up and eat while I’m doing dishes. That would be fun! I wouldn’t mind washing dishes if I could watch hummingbirds right in front of me. I stand very still so I don’t scare them. By the middle of summer they aren’t so afraid of me. It’s pretty interesting to watch them that close. Yes, it is. It’s fun to get them to trust you so they aren’t afraid of you. PJ, do your hummers sound like they are dive bombing you as they zoom by? The one’s at my dad’s house were just plain loud with their hummmmm! Very cool pic! It depend on the species of hummingbirds that are at my feeders. The species in the picture aren’t as fiesty as the others so they don’t try and protect the feeders. The hummingbirds that have orange necks are very fiesty and they will chase away the other hummingbirds by dive bombing them and when I am out by the feeders they will do the same thing to me trying to chase me away from the feeders. I’ ve never made a video but this summer, I will try. Hummingbirds are interesting to watch. I haven’t seen any around here, but maybe I would if I put a feeder out for them. We have a lot of little birds in our backyard and they like to fly after each other around one of the trees in the back. It’s like watching a little show. Our friends that live in the Georgia mountains have hummingbirds around their house and they have the fiesty kind. I found it amusing to watch them dive bomb. I didn’t know about the orange necks…thanks Joy, now I know what to look for. I think I’d like to get a feeder for them and see if they come around here. If I were you I sure would be putting out feeders! Check on the internet and see what species of hummingbirds come to your area. You might be surprised! I love watching hummingbirds! I will have to try a feeder this year? I love watching hummingbirds too. I already have about 6 hummingbirds hanging around my feeders.